Hezbollah’s leader Hassan Nasrallah said on Friday he is “certain” that the terrorist organization would defeat Israel in the next war. In a televised speech aired as part of Lebanon’s commemoration of 18 years since the Israeli withdrawal from its territory, Nasrallah said Hezbollah does not seek a military conflict but is not afraid of one. 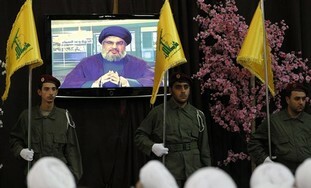 Addressing the new sanctions placed on him by the US, Nasrallah said they will not have any effect on Hezbollah. “They’re meant to isolate us, but we don’t want to visit Europe as tourists anyway,” he said. Earlier on Friday, a Syria war monitor said a Hezbollah military base had been hit in an alleged Israeli missile strike in Syria Thursday evening.